If you’ve ever watched an episode of your favorite TV show and thought about how you wished you could meet someone like your favorite character, you’re not alone. Apparently, even celebrities sometimes think about traits they want their partners to share with fictional characters — including celebrities who are married to the actors who play those characters. Who knew? In an interview with Us Weekly on the red carpet for his new film Hotel Artemis, Sterling K. Brown admitted that sometimes, his wife of 10 years tells him he needs to act more like his fictional This Is Us counterpart, Randall Pearson. 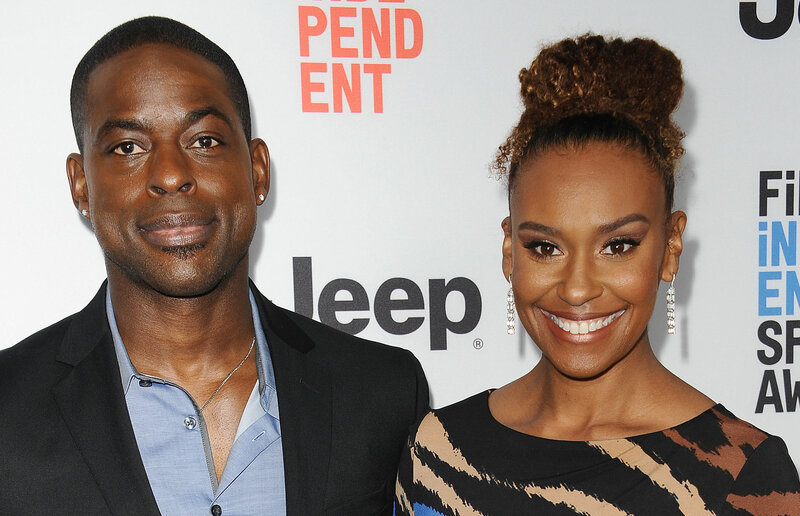 Brown met actor Ryan Michelle Bathe when they were living in the same dorm at Stanford University in 1998, and they have two sons together. They’re absolutely adorable, especially in photos that Brown posts on Instagram. Brown took home the 2017 Emmy for Best Actor in a Drama for his portrayal of Randall on This Is Us, as well as the 2018 Golden Globe for Best Actor in a Drama Series; he was the first black actor in 75 years to do the latter. Bathe, an Army Wives alum, appeared in a Season 1 episode as a mom who approached Randall’s adoptive mom (Rebecca, played by Mandy Moore) at the pool about young Randall’s hair.